Everyone these days bemoans the loss of spelling ability, as our screenagers spend more time in front of screens than with a book in their hands, and the internet is full of quite imaginative spelling. But there is one time when your spelling must be completely immaculate, and that is when coding a website. If your code is off by so much as a comma, your page won’t show up or your website won’t load. To me, it’s a bit ironic that the cultural arena that takes the most heat for the death of spelling actually has the most draconian “spelling” rules for its infrastructure to function. I am not a coder and have no wish to be, but have had to learn a bit as I wade into WordPress to host my blog on a new website which you are viewing (I hope!) right now. My first foray into online journaling, Views and Musings, was hosted at Blogger, which had the advantage of getting me up and running in an hour. But after a while I wanted to “get under the hood” and since I also wanted to build a new website devoted to the book art I’ve been making over the last several years, I decided to build it out from the blog, using the open-source software WordPress. This has caused not inconsiderable hair-pulling and is still far from complete, but as time goes on I will be posting more photographs and writings in the Gallery and Library of this site and will post updates when I make them here on the Journal page. Among the several changes to the blog are new categories – essentially a table of contents to let you find your way around a bit better, and the use of tags to also help you find what you’re interested in. 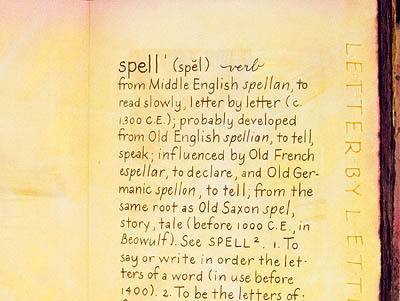 Above is a photo of an opening page of my third Spelling Words book, one of the dictionary-definition pages. Coding is yet another wrinkle in the etymology of the word “spelling.” Certainly I have been doing some conjuring to get to this moment when I enter these letters on my keyboard and some of you out there will read them.